Members of the Bells Elementary School Chess Club competed against 22 other schools from across the state. Members of the Bells Elementary School Chess Club pose with their fifth-place trophy. Pictured from left are, Ryan Woyciechowski, James Cho, Arman Sidhwa, Jake Metviner, Billy Hagerty, Mitchell Savitsky, Aiden Zukovsky, Jack Lipchock, Owen Colligan, Kristina Hagerty, Assistant Coach Colton Murray. Missing from photo were Matt Rodia, Jonah Avis, Brooke Jones, Allison Szustowicz, Brodie Calandro, Nick DeMore, Cole Beschen and Joe Reilly. 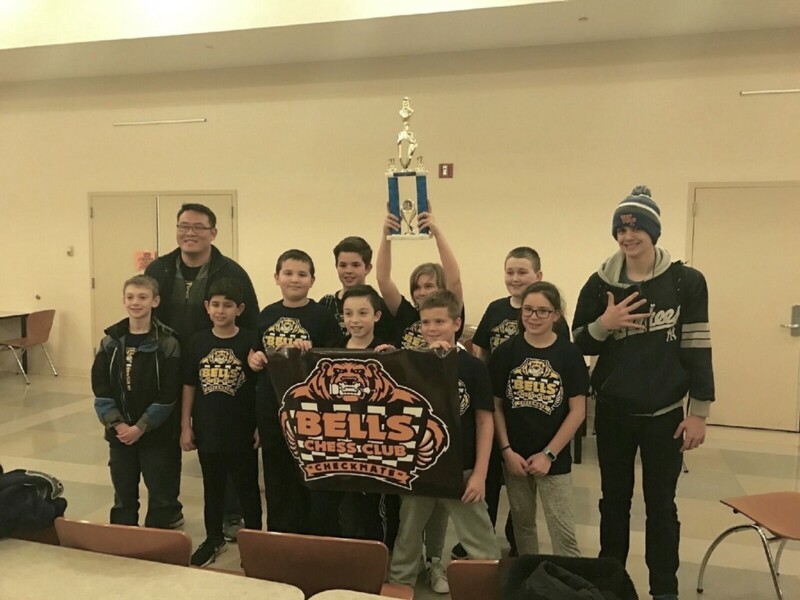 Members of the Bells Elementary School Chess Club finished fifth in the New Jersey State Chess Championship hosted at Brookdale Community College in Lincroft on Feb. 26. Under the direction of adviser James Cho, the students competed against 22 other schools from across the state in the elementary school division as the only public school and the only South Jersey school in the competition.